Your shopping cart is where you place items you want to purchase. As with shopping in a grocery store, you can always remove an item if you change your mind. Our virtual shopping cart even takes it a step further. You can leave the store at any time with items still in your cart; when you come back your cart will be waiting for you with all items still in place. You can view your shopping cart at any time by looking on the right of the screen, below the Live Help banner. Placing an item in your cart is as simple as a click of the mouse. 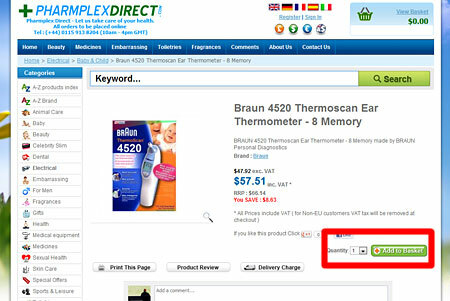 Once you have filled in your product requirements just click on the shopping cart icon that appears in the Buy Now box on the right side of the product description page. You'll be taken immediately to the shopping cart. 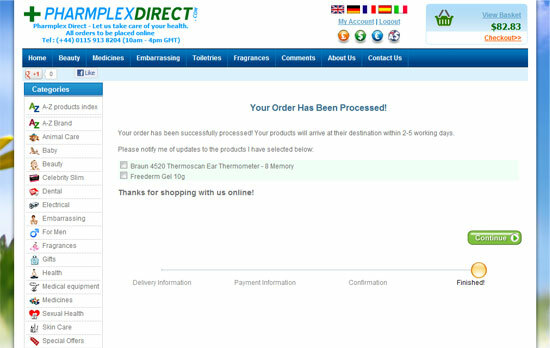 If you already have an account with Direct Pharmplex, your items will be stored here in your shopping cart until you a) remove them manually b) save them for later or c) you complete the Checkout process. If you do not have an account with us your items will stay in the shopping cart during your active shopping session. If you leave without creating an account you may have to add these items over again upon a return visit. Some items require that the you make specific choices such as colour or size before the item can be added to your cart. 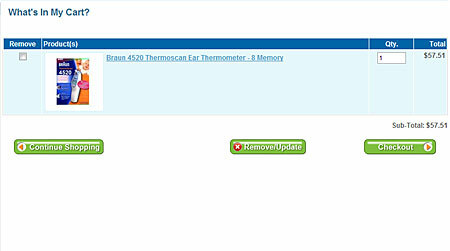 Select the option from the drop down list and add the item to your cart by clicking on the Add to Cart button. Our shopping cart provides you with information about the item or items that you wish to purchase. It also lets you make some changes to your order specifications. If you want to make changes to any of your items such as quantity, just change the quantity and click Update. If you're not ready to checkout, you can continue shopping by clicking on the Back to Shop button. For your convenience, your items will remain in your cart until you remove them or make your purchase. If you're ready to finalise your purchase, click on the Checkout button on the right of the screen below your shopping basket to be taken to the checkout area (please refer above image). 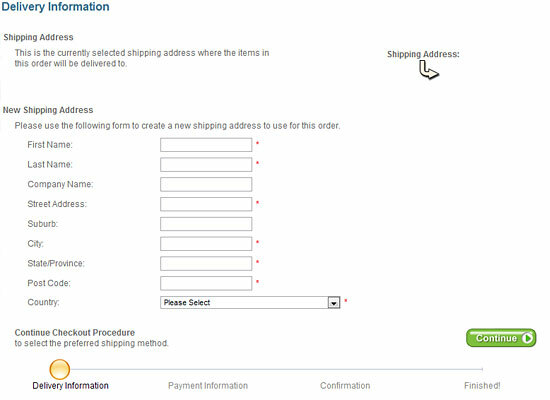 The checkout process takes place in four quick steps: Enter Account Information, Medical Details (Optional), Delivery Address, Payment and Send Order. 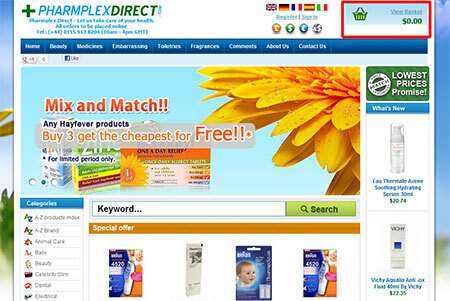 You will be asked to supply your Pharmplex Direct password or register if you do not already have an account. Registration is free and takes a couple of minutes. Your information is held securely on our 128bit SSL secured server. If you are purchasing medication which requires a pharmacist to check over the order, you will be asked for the medical history of the person for whom the medication is for. This is important as it allows our pharmacists to check the appropriateness of the medication. If you are ordering for more than one person, please create the orders as two separate orders. In the Delivery area you can have the possibility of changing the delivery address you normally use. If you do not need to change the address, simply click Deliver to this address. 4. Enter Payment Information and Confirm Order. 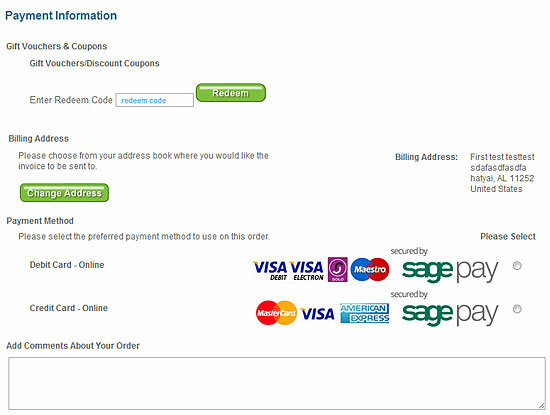 Next you will see a confirmation screen which shows your order, your billing address and delivery address. Simply check you are happy with everything and select a payment option. For your convenience you can pay by Paypal and Google Checkout in addition to Protx. You can also pay over the phone if you feel uneasy about providing your credit card online. Once you have made your selection you will be asked to choose from the available payment methods. 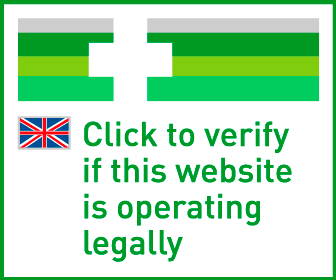 After you have entered your payment details you will be provided with a confirmation order number. 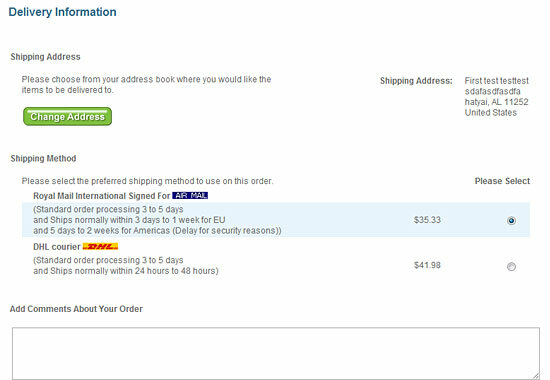 This will also be emailed to you as confirmation that your request to order was received. Once your items are ready to be sent out you will receive an email to confirm your package has been dispatched with the Royal Mail order tracking number.